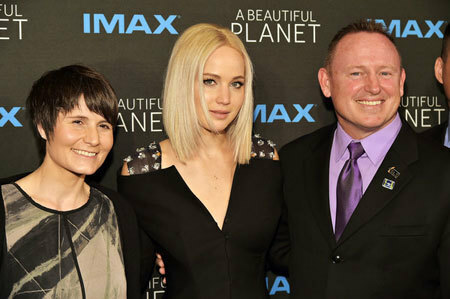 For A Beautiful Planet, an amazing IMAX film narrated by Jennifer Lawrence, NASA Commander Barry “Butch” Wilmore told Kidzworld all about his adventures walking in space and commanding the International Space Station! Butch took an amazing “selfie” with Earth in the background that has been all over social media. He talks about everything from going “pottie” in space to his music preferences and close calls outside on a space walk when a space helmet fills with water! A Beautiful Planet not only shows us examples of life on the space station but gives us amazing Earth views of everything from hurricanes to night-lit cities. Read what Butch has to say and feel like you too are in space! 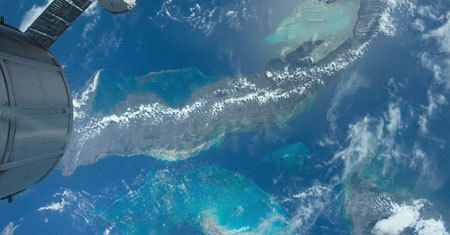 Kidzworld: What was your favorite Earth view from space? There are hurricanes, lightning storms, night lights and more. And what was the saddest thing you saw as far as how Mankind has changed our planet? Butch: You just named them. I’ve got so many amazing memories emblazoned into my mind, and, thankfully, I’ve got this movie now to reflect back on and see them. But, the Bahamas at night, the water, the border of the U.S., the Northern Aurora, the sunrise as you orbit the globe, the southern tip of Africa, the lightning storms in central Africa, hurricane after hurricane, all just a thrill. As for the saddest thing, for me, it’s not so much what we are doing to the planet, it’s the border between North and South Korea, the difference in mentality. South Korea is lit up and looks like a lot of life taking place and North Korea, at night, it’s not lit up at all. The things that are taking place in North Korea, from reports at least, that is just sad. 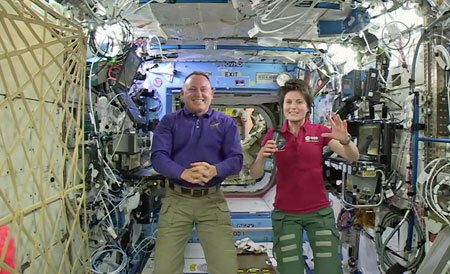 Kidzworld: Tell me something funny that happened while you were on the space station? Butch: Well, I have an 8-year-old and an 11-year-old (girls) and the term pottie is pretty prevalent in our home. There are some things in terms of going pottie in space that you don’t want to know the details of but they are just flat out hilarious. We do have a compartment so you can kind of get some privacy. How do I say this delicately? Occasionally, you think about a swimming fish, very rarely what we call a “brown trout” would escape. Butch: Another funny or fun thing, we had tiny zebra fish in a container we called an aquarium and it had a light in it and they would swim and orient themselves to where the light was above them. I would take a flashlight and shine it in the side of the aquarium and the fish would turn and swim to that. Kidzworld: Oh so playing with fishies in space (he laughs). 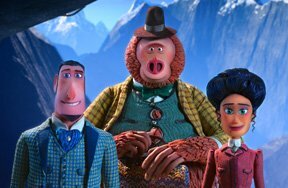 In the film, it looks like unloading and stowing supplies is like a dance. Everyone is floating everywhere. Is that fun or do you all run into each other? Butch: When you first get to space, translating (moving in a gravity-free environment) is not natural. The ability to translate without banging into the bulkhead (is hard). A lot of people translate head first and eventually, on the station, you get used to it. But in cargo ops early in your mission, yes you are banging into this and that. Velcro is a wonderful thing. You can Velcro several bags together and have your own train. Kidzworld: Did you ever come close to running out of anything important before a supply spaceship came? Butch: In 2014 the Cygnus Orbital aircraft bound for the station exploded on take-off with all our supplies aboard. We were watching it. It had all of my Expedition 42 shirts on it. (He was then doing Expedition 41 on the station) and they all blew up. I was taking over as commander of 42 with no shirts. Kidzworld: Uh no food and no shirts! You and astronaut Terry Virts went on that EVA walk in the film. Have you ever had a close call when outside the station in your suit? I’m sure it’s not like the movie "Gravity" with huge space junk hitting you, but ever see anything like that? Butch: No, there is nothing like that that anyone has seen or experienced on a space walk. But, you do see the effects of micro-meteor debris on the space station. There’s little impact craters. But we make it look easy because we train extensively. There is not a normal moment. You can come (slip) off the structure any time. Terry had some water in his helmet and another astronaut’s helmet almost filled up with water. It’s a malfunctioning system within the suit. That’s not been uncommon. 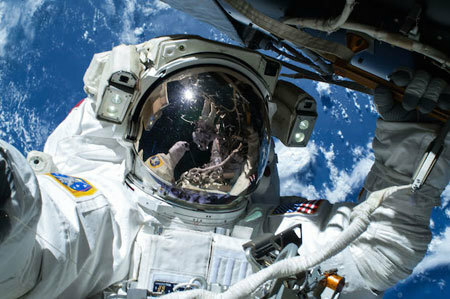 Kidzworld: You took an awesome “selfie” with the Earth in the background while on an EVA. Kids and teens want to know if you do selfies regularly back on Earth like they do. Do you take them with your two daughters? Butch: Yeah we do but I think that was more of good timing with respect to what is taking place in social media. The term “selfie” came in right before that happened. 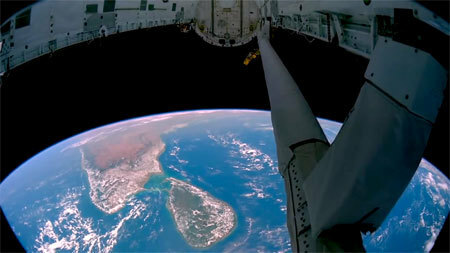 People (astronauts) have taken pictures like that over the years but not using that term. The media grabbed it and it was all over the place, on the “Today” show. Kidzworld: I’m sure it wasn’t funny for you but it’s hilarious in the film when the pretty Italian astronaut (Flight Engineer Samantha Cristoforetti) is jumping up and down on you trying to get your EVA suit off. Does that happen a lot? Were you kind of freaked? Butch: Well there are three sizes of upper torsos for those suits. I measured an extra-large but I squeeze myself into a large. Kidzworld: Sounds like every woman on earth. Butch: (laughs) There are a couple of reasons. It feels better. Secondly my reach is a little bit better but to get out of it without the assistance of gravity, that is the only way. Someone has to pull on the arms to get me out. Kidzworld: You are a decorated Navy pilot. Heck you went to Top Gun flight school! When did you know you wanted to be an astronaut? Butch: I don’t think you decide to be an astronaut and it happens. It’s hard to apply and be accepted. But I had the test pilot experience, I had a masters degree in electrical engineering. You couldn’t fly any higher or faster than on a space shuttle at that time. I thought “Well, I guess I’m as qualified as anybody. I’ll make an application”. Had I been thinking about it? Sure, people think about it but I didn’t think it could actually occur. I just made the application and here I am. Kidzworld: You’ve got engineering degrees but up on the space station are you the “fix it” guy? Like if the AC goes out, do they put you on the job? 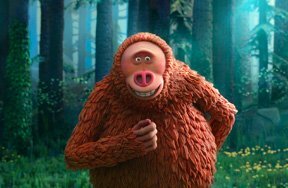 Butch: I think everybody has certain strengths and weakness and fortunately, life on a space station is suited to my capabilities because I am a fix it guy. I do woodworking and those types of things so I enjoy that. As far as maintenance on the space station, that is well suited to my skill set. Kidzworld: What music do you listen to up there? Do you have headsets or does everybody have to listen to what the Commander picks? Butch: You do have headsets but you’re working on a project and we have these good Bose speakers so everybody listens. I’m an epic music guy, I mean stuff that you would hear in a movie, orchestra stuff, big movie soundtracks. “Guardians at the Gate” by Audiomachine. Things like that. 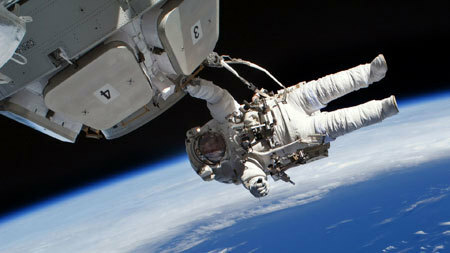 Kidzworld: What happens if you don’t exercise in space? You can’t walk on coming home to Earth? Butch: Look at the people who came back like 15 years ago and those who come back now. 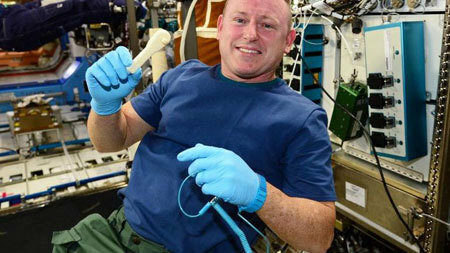 We’ve learned a lot about mitigating the effects of weightlessness, bone loss and muscle atrophy. It feels so good in space to work out. It’s a good feeling. 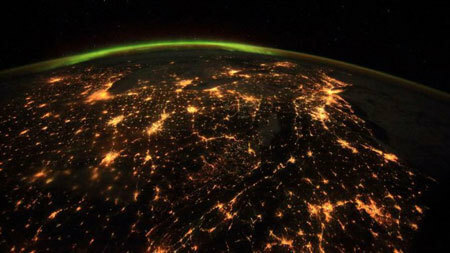 Kidzworld: Serious question: How are you forever changed when you first see the Earth from space? Moon landing astronaut Buzz Aldrin always said he was never the same. Butch: I’m a student of the bible and believe the word of God. I did not need to go to space to learn about God. However, viewing the planet from that vantage point does give me a great appreciation for my God. It gave me a perspective I would not have gotten otherwise. I wasn’t changed by it but I’m appreciative moreso of creation and the beauty of God’s handiwork. It’s humbling. Kidzworld: Cool. What message do you hope teens and tweens might take away from seeing A Beautiful Planet? 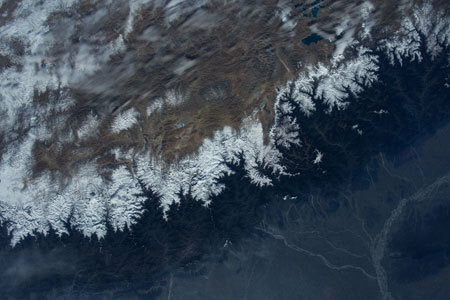 Butch: I think that our planet is beautiful indeed and we have a great responsibility to insure that it stays that way. Not just beautiful in sight but in what it provides us. We need to be good stewards of that. That’s a good message to come away with. 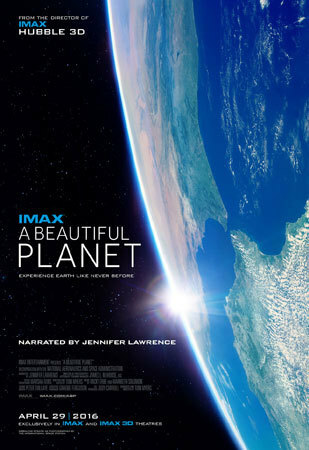 A Beautiful Planet is in theaters April 29th! Would you like to work in space? Do you wonder what life is like on a space station orbiting Earth? Want to be the first man or woman on Mars? Leave a comment! No where - I'd like to just stay on Earth.